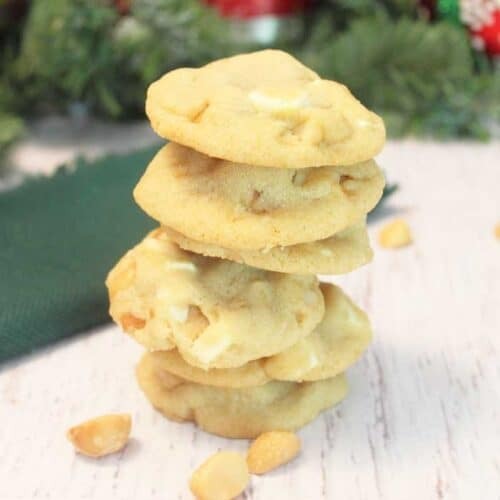 White Chocolate Macadamia Nut Cookies are melt-in-your-mouth delicious! Full of chunks of macadamia nuts & white chocolate big enough to satisfy any sweet tooth. In a large bowl, beat butter & shortening until creamy. Gradually add sugars and beat until well incorporated. Continue beating while adding the egg and vanilla extract. In a separate bowl, combine flour, baking soda & salt. Gradually add dry ingredients to the butter-sugar mixture and continue beating until well mixed. Stir in white chocolate chunks & macadamia nuts. Drop by rounded teaspoonfuls 2” apart onto prepared cookie sheets. Cool slightly on cookie sheets then move to wire racks until cooled completely.